The mandala is a centering space for the self and the soul an art therapy tool for making order out of disorder. Mandala is a Sanskrit word for “magic circle”. Nearly every culture uses mandalas or circular image in their cultural or spiritual practices. Celebrated Swiss psychologist Carl Jung saw mandalas as representative of the unconscious self. Jung said the urge for people to make mandalas emerges during moments of intense personal growth. In his work, he noted how mandala drawings changed over time as healing occurred in his patients. A mandala represents wholeness, a cosmic diagram reminding us of our relation to infinity, extending beyond and within our bodies and minds. Mandalas are circular designs symbolizing the notion that life is never ending. Our earth is a mandala. There are Mandalas in nature and man-made design everywhere we look. Once you start to notice them you will see them everywhere. Art making is an essential practice that can support our positivity and sense of wellbeing, expand our awareness open ourselves to kindness and self-compassion, and deepen our connection to ourselves and others. Mandala art is ancient more than 2,000 years old! Mandalas are incredibly versatile and can personify any number of meanings for the viewer. Sometimes words are not enough to express what we know deep within our core being. 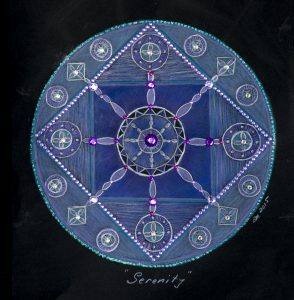 Mandala art can give us that access and expand our self-awareness. Our emotions sometime throw us into chaos and nothing makes sense. At these times, we often need to find a center amid the confusion, a way to pull together the scattered parts of life and find order. 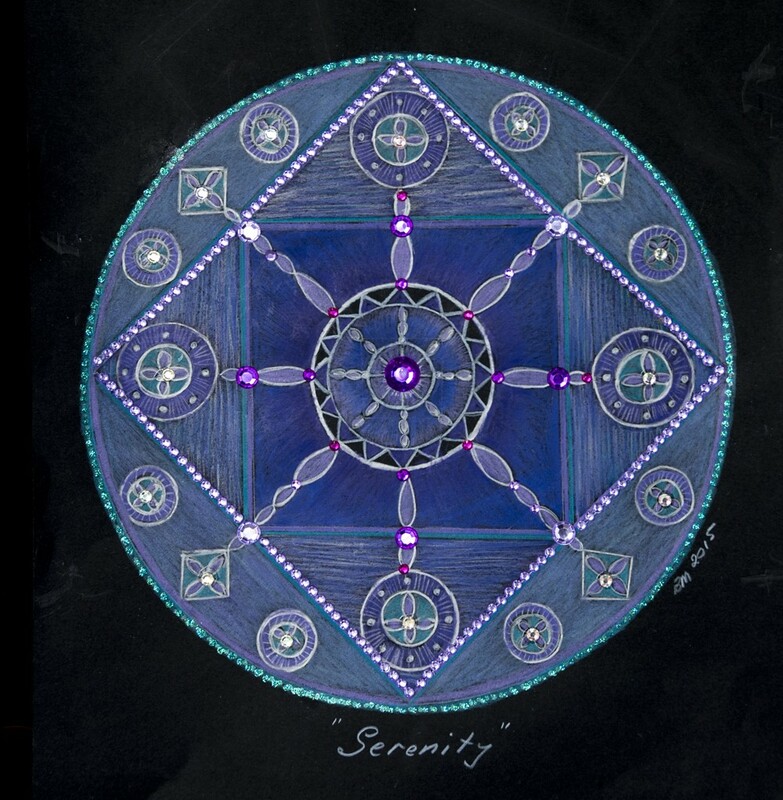 Cathy Malchiodi in her book “The Soul’s Palette” suggests creating mandalas, as a way, to find order at times of chaos in our lives. Mandla art holds a story – our story – about our mental, emotional and spiritual state of wellbeing. Anyone can make a mandala. If you meditate or draw a mandala mindfully you can experience a relaxed and connected sense of being and feel that everything in life is connected in some way. How to create a Mandala? Visual dairies of different sizes. This mandala was created with prisma-colour pencils on black artist’s paper and decorated with rhinestones to create a luminous effect. To get started try using a blank page and draw a circle either freehand or use a plate or circular object as a guide or make a circle with a compass. Using your choice of materials create an image within the circle in any way you choose. You can start in the middle make a mark and see what happens. Use a ruler to draw vertical or horizontal lines as shown in my mandala. Set yourself a 21-day challenge and create a mandala a day. Have fun enjoy the process and watch your positivity, wellbeing and happiness grow day by day. For more information about Mandala Art and workshops Contact Barbara.